A wonderful superfood used for centuries to boost the immune system and fight infection, viruses and bacteria. Garlic contains vitamins C and B6, manganese, selenium and other antioxidants (notably allicin). I usually find it best to use garlic in its dried but fresh form (also known as ‘wet’ or ‘green’ Garlic) as sold in the supermarkets when seeking medicinal benefits rather than taking the powder supplements sold at many health shops. The chemical process used to turn Garlic into a powder reduces the medicinal effects considerably because the potent medicinal chemical allicin (the smelly bit) is taken out, so there’s no point in having odourless Garlic capsules. 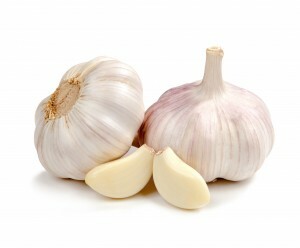 Boosts immune system: Due to the antimicrobial action, use Garlic oil, eat raw or use Garlic Syrup internally for boosting immunity and externally on wounds, bites, cuts and grazes to heal them faster. Fresh Garlic Paste Recipe – One of my kitchen staples! Roughly 2/3 peeled bulbs of garlic – Not cloves!